Recovers from any kind of loss: lost or inaccessible volumes and Time Machine backup, corrupt hard drives and Boot Camp partitions, encrypted drives, and more. Recovers data from any Mac storage device. 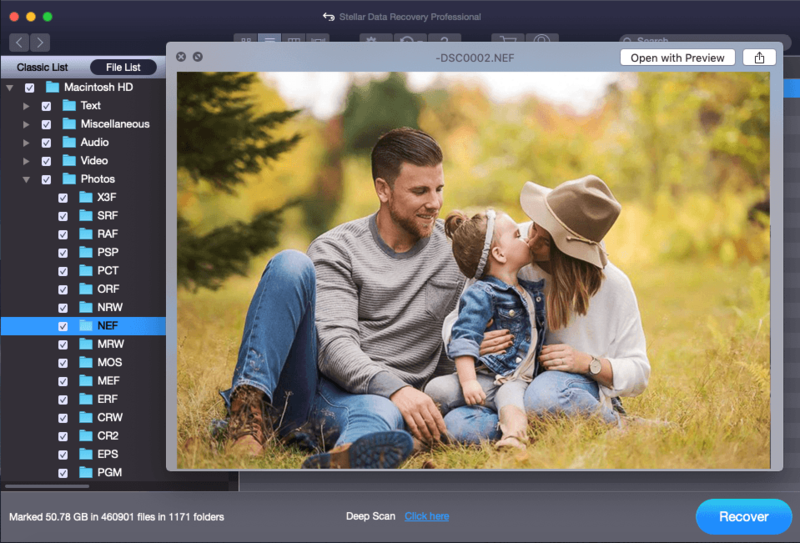 Recover lost or deleted data from any type of Mac device and compatible storage media: hard drives, fusion drives, SSDs, SD cards, USB flash drives, and more. Stellar Data Recovery has been critically reviewed for effective Mac data recovery from all types of corrupt, damaged, deleted, or formatted volumes. Now also supports the APFS file system for macOS High Sierra and Mojave! Recovers lost data due to accidental deletion, hard drive corruption, virus/Trojan attacks, formatted volume, corrupt Time Machine backup, encrypted drive or any other reason. With its smart duo of Quick Scan and Deep Scan, Stellar Data Recovery will locate every bit of recoverable data. The Deep Scan utility even recovers data from RAW or inaccessible volumes! Often a storage drive or volume is not recognized as a ‘Connected Drive’ due to corruption or accidental deletion. Simply use the ‘Can’t Find Volume’ feature to recover crucial data from missing or deleted volumes. Just 3 simple steps— scan for all the deleted partitions, select the desired partition, and recover the data. Locates every partition or volume that was ever created! 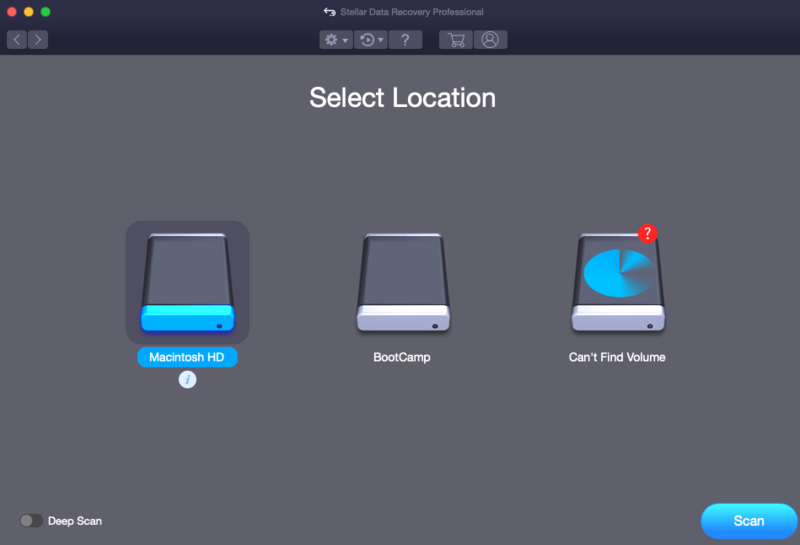 This feature also helps retrieve data from an accidentally deleted BootCamp Partition. Stellar Mac Data Recovery Professional can recover files even if they have been deleted from Trash and restore them fully to a location of your choice. So, emptying the Trash folder will never again result in losing that one important document you thought you would never need again. If you know the exact file type you want to recover (documents, emails, videos, audio files, photos, etc) and it’s possible location then you can customize your scan with these specific parameters. The result is a much faster and more efficient recovery process. The add-on SMART Drive Monitor keeps real-time track of vital system attributes— temperature, drive health, and performance— to help avoid data loss due to hard drive failure. Scan Disk detects bad sectors on a drive and determines whether the affected drive or volume can tolerate data recovery. Clone Disk lets you create a replica of the affected drive to avoid permanent data loss situations due to drive failure. The speed and efficacy of a data recovery tool depends on the condition of a drive; it’s easier to recover data from a healthy drive, while considerably more difficult on a drive with bad sectors. Stellar Data Recovery lets you create an image of such hard drives which can then be used for faster recovery of all your data, thus eliminating the risk of permanent loss. 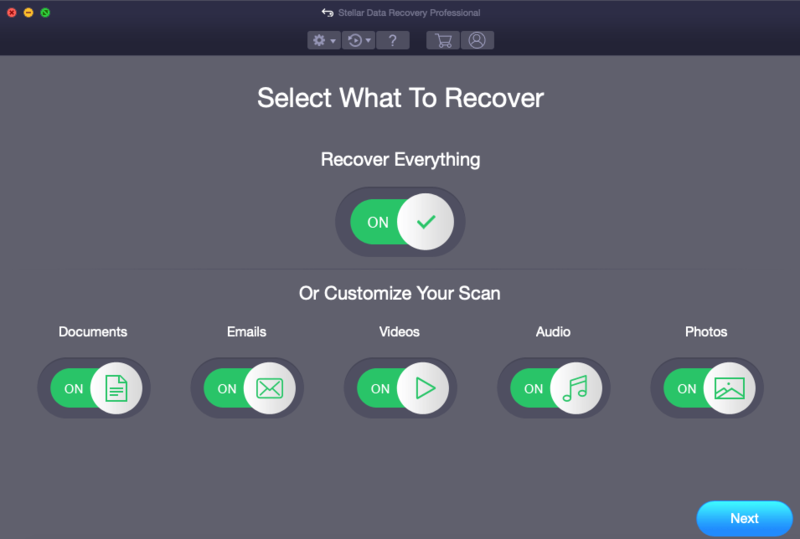 With its simple and user-friendly interface, your data is recovered in simple in 3 easy steps: select, scan, and recover. Preview your recovered data while scanning to help you quickly decide which files that should be recovered. In testing this Mac Data Recovery, I have found it very easy to use…. Read more. Download and see your recovered data before you purchase! 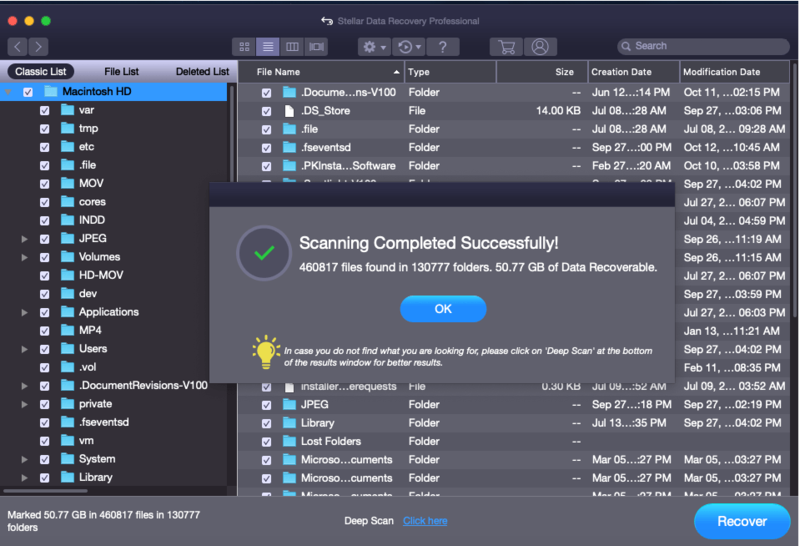 Yes, Stellar Data Recovery Professional for Mac is perfectly compatible with 64 Bit version, and it works flawlessly on macOS Mojave 10.14, High Sierra 10.13.4 and below macOS or OSX versions. However, if you have lost the drive’s password, regular software, including Mac Data Recovery, will not be able to help and only sophisticated specialists might be able to break into your drive and retrieve your data because of how complex modern encryption methods are. Yes. 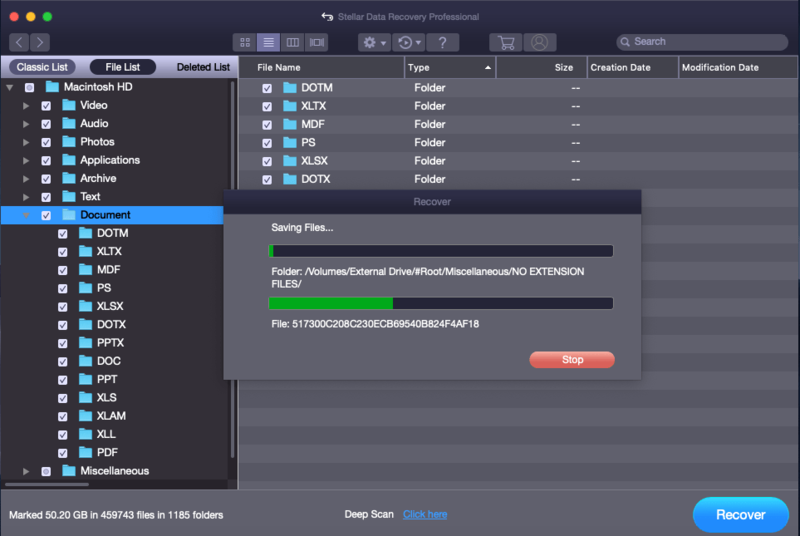 Mac Data Recovery explores all bits located on a drive, attempting to find recognizable file formats and rebuilding them. 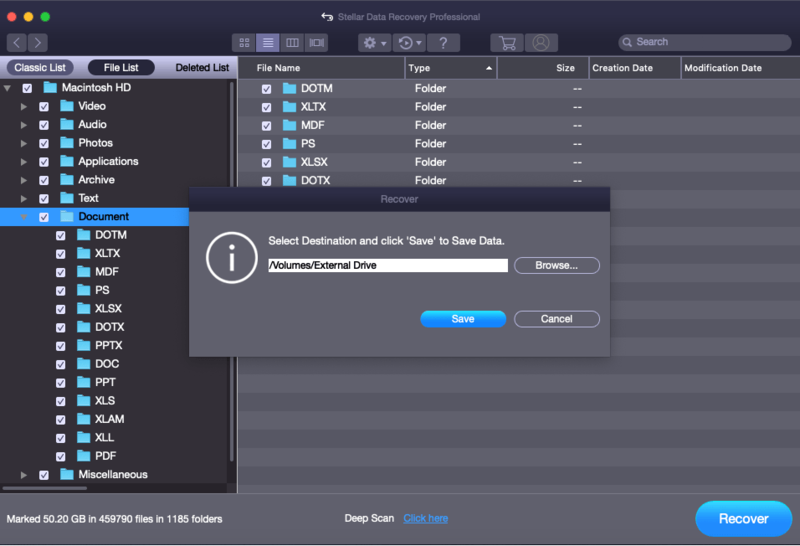 Deleting files from Trash doesn’t overwrite them, but rather opens up their location fully for new data to be written on, giving the old data a chance to be restored. Just avoid writing tons of new data on the drive you want to recover files from, because writing over older data will make it permanently lost.